I've never read Blueberry and always wanted to- I'm determined to remedy this soon. Looking at Jean Giraud's art and what he did with the comic medium has always inspired me to work harder and push myself. And I mean, he was a genius! I guess I don't have much else to say that hasn't already been said by someone who has worded it better than me... RIP Moebius. Every line you drew was perfect in it's place. great choice. blueberry is a fantastic read. moebius and jean-michel charlier created a western epic like no other. 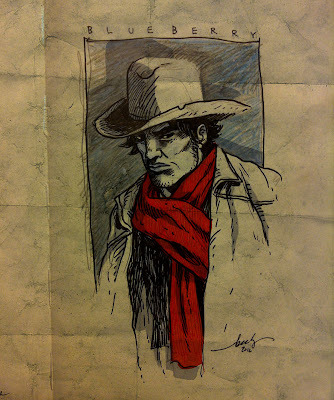 the way moebius captured the west- you'd think he lived there. This a great piece. I also agree with everything Andrew said. Blueberry is some great comics. Awesome Tribute Becky, really love it.